In the past I’ve avoided any sort of reading challenge like the proverbial plague as, these days, I like my leisure reading to be flexible and organic (I gave up reading the things I ought to read in 2001 and from that point on have only read things that take my fancy). 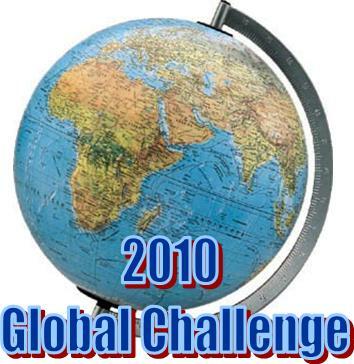 However, this year my curiosity was piqued and I joined my first challenge: Dorte’s 2010 Global Reading Challenge which, at my chosen level, requires me to read 14 books set in different parts of the world. In a fit of challengitis I subsequently and rapidly joined the Audiobook challenge and the Aussie authors challenge. You can check out all the books I’ve read for each challenge at my challenges page but a quick summary is that I’m well on track to finish them all, with the audio challenge likely to be first finished (I’m currently on book 15 of the required 20 for that one). So, how do I feel about having introduced this new element to my reading? Neither of the other challenges has changed my reading behaviour much or introduced me to a single new book. I admit part of that is my fault because I chose challenges that weren’t very challenging to me (I read a lot of audio books and last year I read 20 books by Aussies so aiming for 8 this year was hardly a stretch). But part of it is also the fact that ‘participation’ for all the challenges essentially equates to adding your list of titles read to everyone else’s list of titles read to create a giant list of random book titles. For me there is nothing at all inviting about these lists and I’m never tempted to click on more than one or two links (probably because I always seem to pick a link that leads to a romance title or something else I’m not remotely interested in). Without much discussion, participation seems to come down to ticking things off a list which hasn’t proven terribly motivating for me. So I’ve learned that I quite like a challenge that prompts me to read things I might not have sought out without forcing me into reading things I’ve got no interest in. And I’ve also learned that challenges that don’t stretch me at all aren’t my kind of thing. Are you a challenge joiner? Or is your reading more free-flowing? Are you participating in a challenge that you particularly like? Which one and what do you like about it? I would not consider myself a challenge joiner but a free-flowing reader, but I’m participating in Dorte’s Global Reading Challenge and I have pretty much stick to the rules, new to me authors. I first signed for the Easy Challenge but I was goinng to finish by mid-february so I upgraded myself the Expert Challenge and I did introduce an additional difficulty that was to choose female writres only except for Antarctica. I am glad to have discovered new to me authors and I’m ready to sign for the years to come. So far it was great fun and I subscribe all what you say about this Challenge. Yes the global challenge is good fun Jose, and I do like the idea of picking female authors – perhaps I’ll try that next year if we do this challenge again. Between you and Maxine talking about Claudia Piñeiro’s book you have prompted me to track that one myself for one of the South American books in my own challenge – it sounds like my sort of thing so I am looking forward to reading it. Bernadette – I’m very impressed with the way you’ve challenged yourself! I wouldn’t call myself a challenge-joiner, really. Mostly, that’s because I really enjoy savoring books, so challenges where there’s a time limit can be hard on me. Still, I’ve had great fun being involved in the alphabet in crime fiction meme that’s being led by Kerrie at Mysteries in Paradise. I’m also involved in the Global Reading Challenge, myself, although I admit I’m taking the “easy” route. Still, those are fun! I am not usually one for long running memes and challenges but the Alphabet meme and Dorte’s Global Challenge have been very enjoyable. They have not changed my reading pattern very much but brought a few books that were sitting on my TBR pile to the top, and reacquainted me with some authors I had read previously. I read Claudia Pineiro’s book in 2009 and was very impressed by the brilliant social commentary. The UK is starting to resemble Pineiro’s Argentina. I am aiming for 12 books from 6 continents and so far have completed Europe, North America and Asia while I am on my first African book now. I have caught on the Challengitis BIG time! Thanks to website like Novel Challenge (blogspot), it listed thousands of Reading challenges hosted around the Blogsphere. That probably explains why I’m not quite so absorbed by challenges JoV – I have no competitive streak whatsoever. I used to play team sports and often finish a game without knowing (or caring) who’d won. I join challenges quite cautiously as I hate it when I can´t live up to my own expectations. Last year I passed my two challenges with flying colours, though, so I have ventured on three this year (and I feel very brave).